ZRemesher can evaluate your model’s volume and create its topology symmetrically, even if the original topology is not symmetrical — such as when using scan data. This option uses ZBrush’s standard symmetry controls rather than adding additional settings to ZRemesher’s options. If you want your retopology to be symmetrical across the model’s X axis, simply make sure that Transform >> Symmetry is turned on, with the X axis active. If you need dif­ferent settings or even no symmetry, simply adjust the Transform >> Symmetry settings accordingly. ZRemesher includes two symmetry algorithms, which will alter the way the model is analyzed and can have an impact on the topology result; in particular on the symmetry working plane. If you wish to try the alternative symmetry algorithm, hold the Alt key while clicking the ZRemesher button. 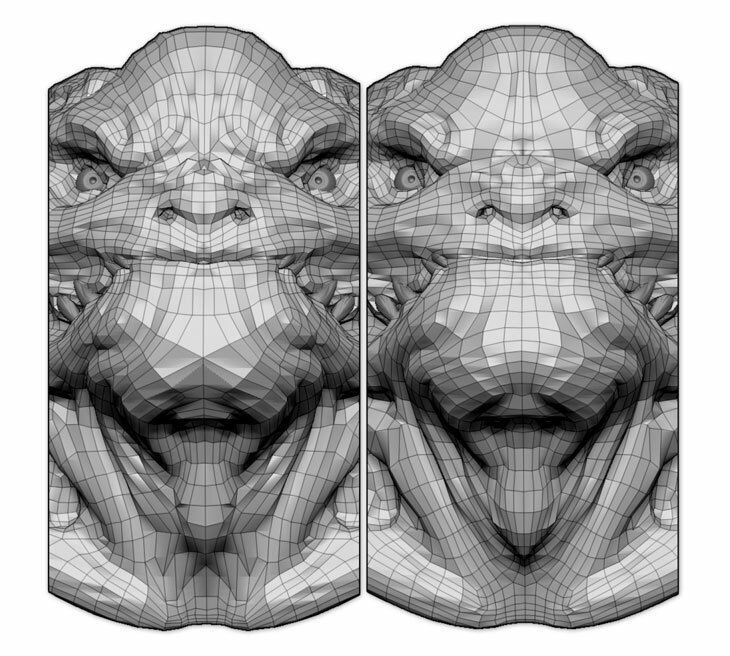 On the left, the default symmetry algorithm and on the right the alternative one. The differences across the symmetry plane are clearly visible. Model courtesy of David Richardson.